During a visit to New Athos, Teyla and Dr. Keller find themselves on the run from a primitive tribe of warriors. “That [episode] was a wild and woolly ride, and for so many reasons. Emotionally it was crazy because I was pregnant with my son Caden. At that point I had not told anybody, with the exception of our producers and writers, and this was the very first episode that I told James Bamford, our stunt supervisor, of my condition. So that was going on, and then Jewel Staite and I were carpooling for that entire episode. She would come very, very early in the morning over to my place and then we’d drive together because we were shooting on-location, so she was also one of the first people I told that I was pregnant. “‘Missing’ was an equally emotional as well as physical episode, and I was dealing with my pregnancy and doing the biggest fight sequence that I had probably done to date. One of the bad guys that I took on was actually my husband [actor/stuntman Loyd Bateman], so there we were trying to pull that off, knowing what was actually transpiring for us on a personal level, which was very interesting. “This episode was terrific insofar as where it put Teyla in terms of the fact that now her people are all missing. What an incredibly emotional place to find herself, and playing that off Jewel was just lovely. She is a wonderful actress and a riot to work with. Jewel has this wry sense of humor, and I can’t imagine going through that journey with anybody other than her because everything was an hilarious joke. It was pouring rain, freezing cold, there was mud everywhere, we were doing all sorts of strenuous stuff, and yet everything was funny with us, so thank God for that. VOTE! 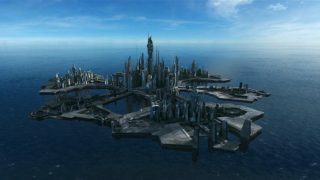 How would you rate Atlantis's "Missing?"